The Morning Of is one of the most underrated bands out there. 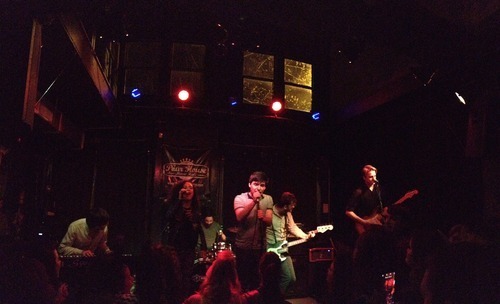 The group decided to get together for a reunion show last Friday at The Pour House in Raleigh, NC. The audience was consumed by friends, family, fans, and excitement. Every Raleigh kid that went to old beloved venue, The Brewery, knows that energy I’m talking about. The Morning Of opened with “Jennasea”, and ended with a never before played song “Heaven or Hell”. The set list was mixed of new and old songs, including “Pilot To Base”. This was the bands first show in about 2 years, and they still passed the bar with the energy that lit up the room. I sadly only have the picture above, but to be honest, I don’t even believe that photos or videos could document the passion that went through those speakers that night. I have never seen a band so happy to be playing together and seeing the crowd chant back their lyrics. The northern band, The Morning Of, will forever be a favorite of Raleigh, North Carolina, the band couldn’t have chosen a better location to play their reunion show.